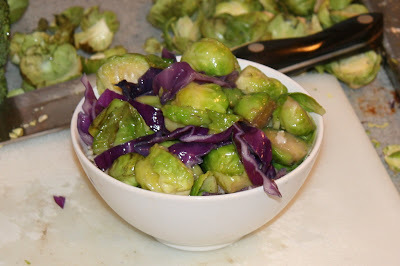 Brussel sprouts, red cabbage ribbons, sauteed in butter and a bit of salt... over a bed of brown rice with some Bragg's. I could eat like this every day. My kids are currently eating carrot sticks and raw red cabbage chopped into chunks with curry mayo dip and bowls of brown rice with melted butter. They could eat like that every day. With the occasional pizza Friday. But my husband? He is the wrench in the works. And he is a LOT better than he used to be. He used to eat nothing but pasta and McDonald's... and occasional Thai and Chinese for me. He is from Los Angeles, so Mexican was out for a while... but I got it back in. :) And slowly, over the last decade, he actually eats real food. Always mixed with pasta of course. I still find food so facinating. Brussel sprouts are in season right now and my kids call them "mini cabbages". Which means they will eat them. lol... but only a couple times a year and only sauteed in butter with dill and salt. There are many things still in season. Some (like the lettuces) are on their way out... and some are long gone. But there is still so much local bounty out there! And of course, it is the season for my favorite squash of all. Some butter, a little brown sugar. Omgoodness... if you haven't tried a delicata, please, do yourself a favor. They are amazing! And I am cooking one right now. I have been trying to stop us from the junk food cycle it is so easy to step into when you are in a time of transition and stress. It hasn't been entirely sucessful.... we have eaten out more than I care to admit. But I have a plan now... because we need to use the food we have before we pack it all up and trasnfer it to the new house. So I have listed all the stuff we have and am in the process of making a menu from that. We can hope it is going to work... right? The only problem is that I am still probably having Thanksgiving at my house, and that means that all the farm goodness I could get for that dinner will have to be packed and transported. I will have to plan for that as well. I guess pencil and paper will be working overtime tonight. Yummy!!! We just got 3 bunches of brussel sprouts still on the stalk from the farmers market. I plan on making them tonight with Salmon! My birthday dinner! Yum! I feel so silly though because I planted brussel sprouts in the garden and then not knowing what I was looking for in the final result (i thought they grew on the top like a cabbage, ) I murdered the plant figuring it just had stopped growing. Now I recall seeing the little buds on the stalk and not realizing that's where the sprout starts! Ack!!! I had a total "ah-ha!" moment when I saw them on the stalk at the farmers market. I LOVE brussel sprouts. I will try it your way. I roast them in the oven with balsamic vinegrette. Try a pie pumpkin stuffed with walnuts, brown sugar and maple syrup. OMGoodness.